The Metropolitan police said Wednesday that they have identified the suspect behind the Westminster car ramming attack as a 29-year-old UK national of Sudanese origin. “A 29-year-old man arrested following the incident in Westminster yesterday, Tuesday, remains in custody at a south London police station. “The man, who is a UK national originally from Sudan, was arrested at the scene by armed officers,” the police said adding that he was subsequently further arrested for attempted murder. Earlier in the day, the Sky news broadcaster reported citing sources that the name of the suspect was Salih Khater. Read also:Another terror attack at House of Parliament in London? Police also said that they have carried out two searches in Birmingham and another in Nottingham while the third search was underway in Birmingham’s address. 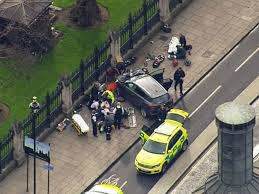 On Tuesday, a Ford Fiesta collided with several cyclists and pedestrians before crashing at high speed into a security fence outside the Houses of Parliament. Three people were injured in the incident.